Takashi Miike is not only one the best Japanese filmmakers working today, he's also one of the most prolific. Working in the film industry since the late 80s, starting off his career as an assistant director, Miike is best known for great films like Audition, Ichi The Killer and The Bird People In China, and has ceased to slow down, continuing to produce as many as two features per year. One of his latest, Hara-Kiri: Death of a Samurai, was released here in the States in late July and will be expanding into new markets this weekend, and to celebrate we have something awesome to give away. To promote the expansion of the release, we have been given a Hara-Kiri poster signed by Takashi Miike to give away to one of our lucky readers. The director rarely signs autographs, so it's a very cool prize. You can check out the version of the poster and how you can win below. To enter, head over to the Cinema Blend Facebook Page and hit 'Like.' From there, click on THIS POST and leave a comment letting us know what your favorite Takashi Miike film is and why. Simple as that! We will be running the contest until Friday of next week (September 7th) so get your entries in! 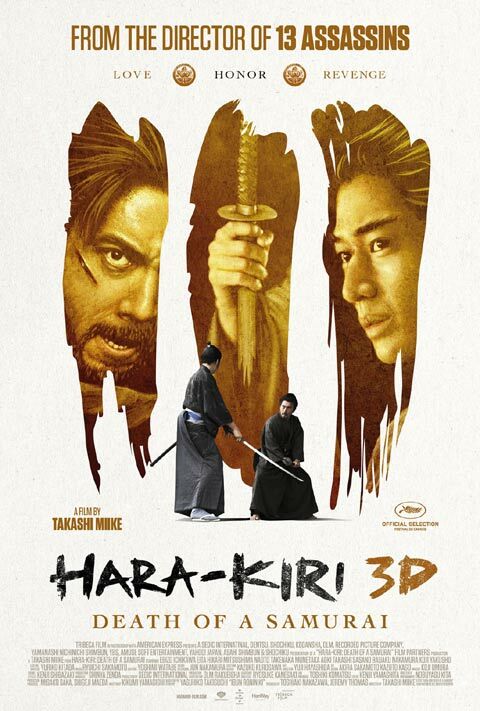 Hara-Kiri: Death of a Samurai, the first 3D film to ever show at the Cannes Film Festival, tells the story of a poor samurai who learns the fate of his ronin son-in-law and swears vengeance against the house of a feudal lord. The movie is based on the novel by Yasuhiko Takiguchi and stars Kôji Yakusho, Naoto Takenaka, and Hikari Mitsushima. See it in theaters this weekend!